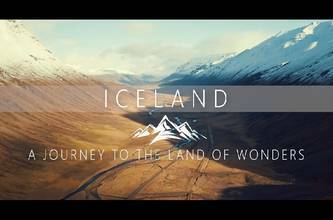 Description: So it has been done, my first cinematic travel film about Iceland, the Land of Wonders and of course the land of fire and ice. Must be one of the most amazing places in the entire world. You got everything from snow-capped mountains, splashing waterfalls, glaciers, deserts to volcanoes. Not to forget the majestic Northern Lights, or Aurora, as they (fun fact) also exist on the southern hemisphere. My wife and I and the chance to spend one week in this amazing country. Let's admit that is not a enough, but we did not have more holidays :) so we made the best of it. https://guidetoiceland.is provided some amazing travel tips and places to visit. So we ended up renting a small car for our journey along Route 1, the Ring Road, which is almost completely paved. You might have heard already, but in Iceland most of the roads are actually gravel roads, which is fine, but you might need an off-road car if you plan to travel into the center of the island. After stopping like every 5 minutes along the road and capturing everything I could, and after quite some hours of editing, I am happy to present this travel film and really hope that you like it. You might also want to have a look at my Instagram account. I will upload a little series of the best shots I took during the trip https://www.instagram.com/alexander.schmidt.photography/ Also a big thanks to Non Copyrighted Music, for this amazing EPIC song, which fits just perfectly to this EPIC country! ------------------------------------------- Music provided by Non Copyrighted Music: https://youtu.be/hb0q4z_E9r0 Music used: Ultra by Mattia Turzo & Jacopo Cicatiello https://soundcloud.com/mattia-turzo-1 https://soundcloud.com/thelittleorche... Licensed under Creative Commons Attribution 2.0 https://creativecommons.org/licenses/... ------------------------------------------- And last but not least, don't forget to subscribe, like and comment.